France coach Philippe Saint-Andre and England boss Stuart Lancaster may have made a winning starts to this year's Six Nations but they have some way to go to match the achievements of their predecessors in the northern hemisphere's showpiece event. With this in mind, ESPNscrum trawls the Statsguru archives to determine who is the most successful coach in Six Nations history. Since Italy joined the party in 2000, France have scooped the most titles with five. And it is therefore no surprise that their two previous coaches Bernard Laporte and Marc Lievremont figure strongly with win ratios of 75% and 70% respectively. While Laporte experienced huge success during his tenure with four titles and two Grand Slams, Lievremont also orchestrated an elusive clean sweep in 2010 to go some way to replicate his predecessors' success. While Lievremont and Laporte took the glory on the European stage, they failed to repeat that success at the Rugby World Cup. Laporte's reign came to an end after the 2007 World Cup having failed to guide his side past England in the semi-finals despite accounting for the All Blacks in the quarters. France had also come up short against England in the 2003 World Cup semi-finals. Lievremont's reign ended in ignominy - despite guiding Les Bleus to the final of the 2011 World Cup - with reports of infighting within the camp. Despite their success, the pair sit third and fourth on the ladder when it comes to win ratios in the Six Nations with Wales' Mike Ruddock leading the way on 86%. Ruddock scooped the 2005 Grand Slam with Gavin Henson at the forefront of a new-look Wales. But the feel-good factor came to an abrupt end for Ruddock's Wales after a hammering at the hands of the All Blacks in November 2005 followed by a defeat to England in the opening game of the 2006 Six Nations. Ruddock would take charge of their next game but it proved to be his last with 'contractual disputes' heralding his exit mid-Championship. Scott Johnson took temporary charge of Wales before the Welsh Rugby Union eventually turned to Gareth Jenkins whose own relatively brief tenure saw his side narrowly avoid a Wooden Spoon and fail to reach the 2007 World Cup quarter-finals. His departure led to the appointment of Warren Gatland who had previously coached Ireland in the Championship. The Kiwi has since fared well in the tournament with a win ratio of 68% and along the way, Wales scooped the 2008 Grand Slam and reached the World Cup semi-finals last year. When it comes to win ratios, Ireland are the most consistent with all of their coaches featuring around the 70% mark. Eddie O'Sullivan sits on 69% with his replacement Declan Kidney also on 69%. Kidney, who along with Gatland has been tipped as a potential Lions coach, has also replicated his Kiwi rival's Grand Slam success having guided Ireland through an unbeaten campaign in 2009 - something O'Sullivan never managed to do despite flirting with the prospect in the past. But when it comes to achieving success both on home and foreign turf, Sir Clive Woodward sits far above the rest. He has a proud win ratio of 80% in the Six Nations but his 72% rating overall also dominates those around him. The 2003 World Cup will be remembered as his proudest moment but victories against New Zealand and Australia away from home will also go down as a sign of his success in charge of England. Woodward laid claim to three Six Nations titles and the only England coach to have scooped the Championship since is Martin Johnson. Despite the controversial end to his stint in charge, Johnson sits second among England coaches on 60% - joined at the hip with Brian Ashton. However, Johnson can lay claim to an all-important Six Nations title in 2011 and a notable victory against Australia back in June 2010. When talking about win ratios in the Six Nations it is no surprise that Scotland and Italy feature less prominently having failed to produce the consistency of their rivals. Both sides have earned praise for one-off results - with Italy beating France for the first time last year and Scotland often proving a thorn in England's side at Murrayfield - but their win ratios are poor. Sir Ian McGeechan's 35% return as Scotland boss is the leading mark from coaches to have taken charge of either country while former Azzurri boss Brad Johnstone's 6% props up the rest. 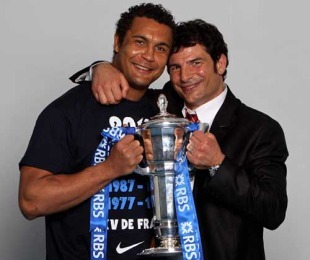 So while the likes of Lancaster and Saint-Andre deserve praise for starting in the best possible way, they should be mindful of the fact that they have some way to go to match the achievements of the greatest coaches the Six Nations has seen.